At times, my cohort and I intern at the wonderful Freeville Organic Research Farm in Ithaca. These days are far and too few, but truly wonderful! Admittedly, Freeville is great because it is much closer to campus than Geneva is, but it’s also great for several other reasons. Specifically, we’re running about three experiments in Freeville. However, today, we concentrated on one key experiment involving string beans (did you know there are actually strings in string beans? Because I didn’t). 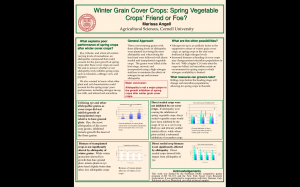 Liz, Joe and I collected data involving how tillage affects amount of weeding. Earlier on in the summer, we collected some interesting data on how long it took us to hand weed a few of the plots. It was definitely hard work, but we learned a some cool things about how spring versus fall tillage makes a difference in how many weeds spring up and how fast or slow hand weeding is in reference to that. Today, Liz and I pulled some of the bean plants for biomass data while our boss rated the plants for presence of root rot and white mold. There was no white mold, but according to Joe, beans plants never really have great roots, so they didn’t score very high on the awesome root scale. Either way, some of the bean plants definitely had better roots than others. On a few of them, you could see nodules, which mean that they were probably fixing nitrogen. 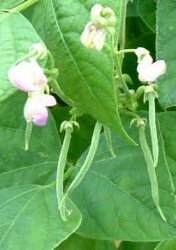 Factoid: you can tell if a bean plant is actively fixing nitrogen and you see pink inside. Cool! We couldn’t tell differences in the tillage systems from today’s data, but I’ll keep you updated! Tomorrow is sadly my last day of work, but it should be pretty neat because we’re harvesting beets. Dear captive audience, I will definitely keep you in the loop for more exciting adventures! Buckwheat, broccoli, and tomatoes.. Oh my! I’m learning just how hard it is to do agricultural work for ten hours on a regular basis. Recently it’s been over 100 degrees Fahrenheit where I work! It’s tough because by the time that I get there, it’s already 8:30, when the heat has already climbed to about 90 degrees. I’m learning to deal with heat without complaining, which is pretty hard. I have mad respect for farmers that are out in it all day long! It gets tough when you need to drive a tractor with a black leather seat and the engine generates a bunch of heat. But that’s ok! Because we’re tough! This is essentially what I’ve been talking about for the past few weeks. 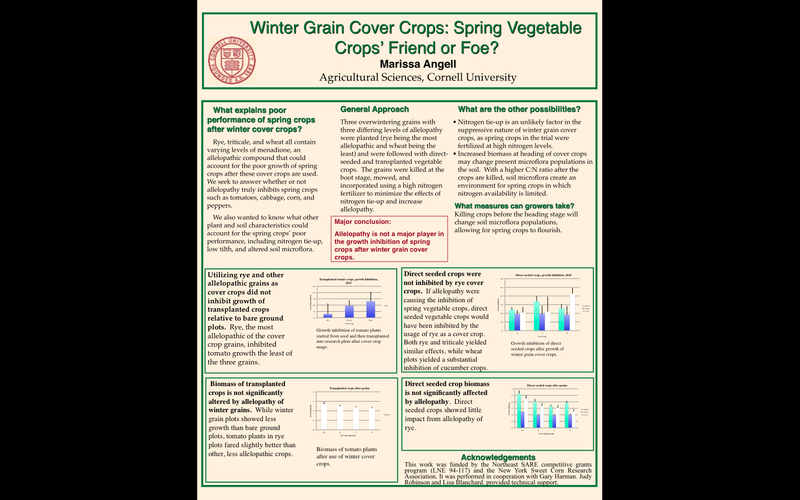 What we’ve found with the research is pretty interesting; basically, using rye as a cover crop doesn’t diminish spring crop performance because of allelopathy, but for other reasons. We’re not sure yet, but are working on it! My boss thinks it’s changes in soil microflora, but we won’t know until we run a few more trials. Anyway.. It was so hot Thursday afternoon that working out in the fields would have been a really bad idea. So instead, my supervisor and Thomas decided to take us out on a wonderful road trip to view a bunch of different farms around the Seneca/Geneva area. It was really informational! And Liz and I got a lot of neat pictures. Interestingly, a lot of the fields around Geneva use Roundup Ready corn and soy, which I wouldn’t have predicted. You can tell because the weeds that should be around the plants look very brown and crispy. As many of you might know, the Seneca area/Finger lakes region is also great wine country! We have really fertile soil for growing grapes and other fun alcohol making materials. Thomas’s wife actually owns Wagner’s, a great winery near Seneca lake! I highly recommend it. They play music weekly. Check it out! Fun Times on the Farm! Time is going by quickly in my internship at Geneva. We’re starting to gain speed on a lot of projects relating to mustard, pumpkins, cucumbers, broccoli, buckwheat, and cover crops. Isn’t buckwheat pretty? No wonder Thomas likes it so much! Recently, we’ve been taking a panoply of different measurements and getting exposed to different tasks without the help of our supervisor. One of the more interesting devices that Liz and I have gotten to use is a penetrometer- an device (sort of shaped like a T) that measures density of the soil that you are growing plants on. In order to use it, one has to insert the penetrometer into the soil and note a reading that appears on a dial at the top. The trick with the penetrometer is to not take all of the measurements by yourself! It seems fun at first, and the fun doesn’t diminish as you crazily stab the metal instrument into the ground, but it sure gets tiring. So it makes sense to trade off with a partner so your penetrometer doesn’t take the brunt of the damage. What we’re starting to see so far with the penetrometer readings is that areas where a cover crop has been grown tend to be a little bit more aggregated due to root structures of the cover crop (like our dear old buckwheat). Soil is a pretty interesting indication of how healthy your plants are going to turn out–if there is a hardpan, i.e. a really bad crust from poor soil management, your crops aren’t going to turn out so well. What Thomas Bjorkman is researching is the impact of these cover crops on a variety of soil health issues. Last week, Liz and I actually got to hop on the tractor and plant Bolo pumpkins for a study involving the impact of allelopathic mustards on pumpkin plants. It was pretty exciting, not going to lie, to drive a tractor super slow down half a length of a small field. You feel pretty powerful sitting up there being in command of a machine with a lot of horsepower! There are a lot of safety aspects to remember though. Perhaps the most important thing we learned was to keep our hands away from any moving equipment, chains, and gears (duh) and to push in the clutch at the first sign of any emergency. We’re pros now! Last, today was an interesting study in both resourcefulness and amazing agricultural technology. In setting up drip irrigation for a plot of broccoli (which our boss insisted must be kept both immaculate and gorgeous), we learned about how important gravity is in making any system with water work properly. Also, keep kinks out of any hoses! Our broccoli was happy once our irrigation system was both properly lined up and kink-free. For bigger fields, we utilized a much more complex tool. Our supervisor, Joe, hitched a large traveling irrigation cart to our van, drove it out to the field, and then left it in the middle of the field. The head of the apparatus, which looks like a common sprinkler, jettisons about 300 or so gallons of water per minute (or something like that, I think I was a little lost in the details) to a buckwheat patch. The head is on a rolling cart on wheels, which is attached to a water hose, which lies down the length of the field and is wound around a huge spool of sorts. As the field gets watered, the spool retracts hose into itself, pulling the cart with the sprinkler down the length of the field. It’s pretty cool! I’ll attach a picture so that my confusing definition doesn’t get more confusing. Well folks, that’s all for today! Liz and I barely made it alive out of a large thunderstorm, so I’m counting my lucky stars I’m able to blog to you about our busy days in Geneva. More posts coming soon! My name is Marissa, and I’m interning in Geneva, NY as an intern for a researcher named Thomas Bjorkman. 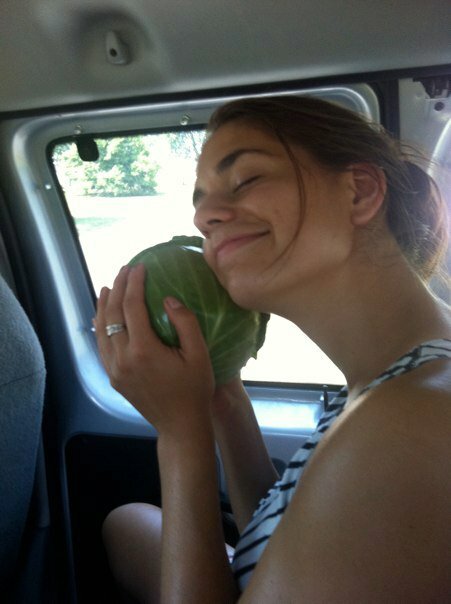 Thomas primarily studies cool things about broccoli, such as heat stress, but my loyal compatriot co-worker Liz and I primarily assist on several different projects, which I will explain! Thomas works on figuring out the effects of cover cropping on soil and soil microbial communities. It’s pretty cool, and as you can imagine, a pretty long study as well. 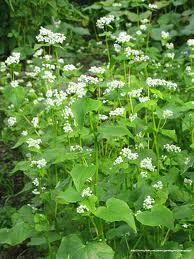 One of the primary cover crops included is buckwheat, which is used in products such as Kasha (for all you Eastern European Jews out there!) and buckwheat noodles, called Soba, in Japan. Another study researches the effects allelopathic plants on vegetables such as pumpkin. The specific plants he’s looking at are mustards, which contain a compound called Isothyocyanate. It’s a cyanide-like compound which can spell trouble for a lot of different plants, but has some pretty cool effects in the field. Specifically, Liz and I do things such as set up research plots with stakes and flags (which is a lot harder than it sounds), transplant plants such as broccoli, cabbage, and peppers, collect biomass data on plants, test soil conditions using a penetrometer, and take care of plants in the greenhouse. Our job never gets boring because we do something different every day. I have to admit though, it might get dry without Liz, but I really enjoy what I do. Just a few days ago, Liz and I got certified to drive a tractor! Coming from a background that doesn’t involve agriculture at all, it was a really fun experience for me. I may not be very good at backing up an actual car, but I did it nearly perfectly on my exam. I was really proud of myself! Safety perimeters are a lot more intense on tractors though; because their center of gravity can get off easily, the potential for them to tip over is pretty great. It’s not hard to feel unwieldy on one of them. So, before I depart from this post, I’ll attach a picture of Liz and I transplanting cabbage on tractor/planter. Lots of fun!